Like many growing companies in the bay area, Evernote struggled to hire elite technical talent quickly. 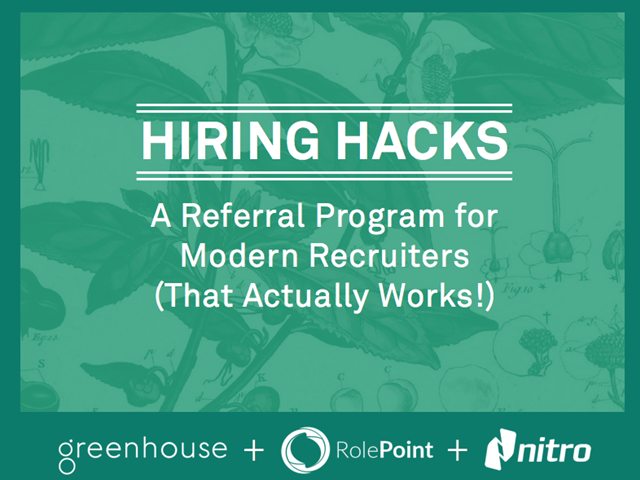 In this webinar, lead recruiter at Evernote, Kelly Grossart, shares how the Evernote recruiting team has created a better interview experience for candidates and hiring managers, rebuilt the technical interview plan, and leveraged HackerRank and Greenhouse to find and hire top technical talent. Kick off the new year by improving your interview process! Join us for a hands-on webinar to get practical tips on how to speed up the interview process through video interviewing. Learn how companies like ZenPayroll, MeySen Academy, and others use Spark Hire and Greenhouse to interview at scale and hire faster than their competitors. Get tips and tricks to implement today, and learn about some technologies available to help you in the new year! See how Pinterest optimizes its recruiting operation. Join Daniel Chait, CEO of Greenhouse Software and Josh Anderson, Director of People Operations at Ibotta as they discuss best practices for building a Structured Recruiting process. Get tips and insights on sourcing strategies, interview planning and making quicker, smarter decisions about candidates.